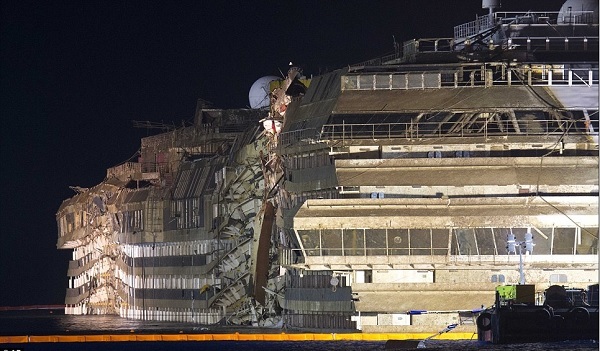 Divers have found what they believe to be the bodies of the last two people that were missing from the Costa Concordia. Russel Rebello, an Indian waiter and Italian passenger Maria Grazia Trecarichi were reported missing after the disaster, but their bodies never found, until now. The head of the civil protection agency Franco Gabrielli told reporters the remains discovered on Thursday were “absolutely consistent” with the two missing people, an Indian man and an Italian woman. Divers found remains lying just outside the hull on the seabed. They still have not yet been brought ashore, but the process is underway. Once ashore DNA tests will also be carried out, only once the DNA tests are complete will we know for certain if the bodies are in fact those of the missing two, but family members of both individuals have been notified. The Costa Concordia, which had been lying on her side in shallow water since capsizing in January 2011 was recently righted during a process known as Parbuckling and is due to be towed away from Giglio by next spring. She will then be scrapped. Prayers and closure to the families and thumbs up to the cruise lines for providing them closure. CCL is to be commended.